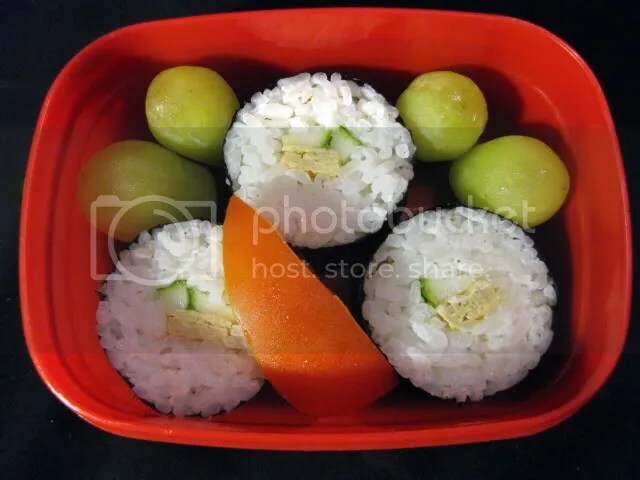 You’re right, I love that Just Bento site. I got started with bento and then stopped when it got cold, but thanks for the reminder. My oldest has just got very very fussy, so I think it’s time to pull out the boxes and dividers again. I have some little silicone cupcake moulds that make great dividers, and seeing I’m in the city at the moment it’s a great reminder to collect all the spoons and picks, and maybe have a look around for what else I can see. When I was doing it I found it very reassuring – I knew she was having a good mix of foods. They all look great! 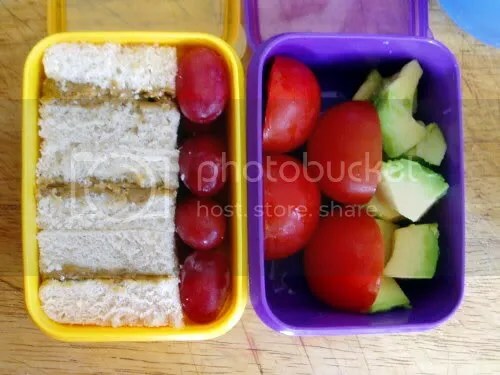 My Mum used to pack very pretty lunches for us – no soggy sandwiches in a paper bag! We loved it and never wanted to trade with anyone! Consequently I do the same thing when we go out or for a picnic and the kids love it! I must say though, your first little sushi picture would fill up about 1/8th of my stomach!! Indeed! It would fill about an eighth of my stomach, too – but when the Dumpling was about 16 months it was more than adequate for him. 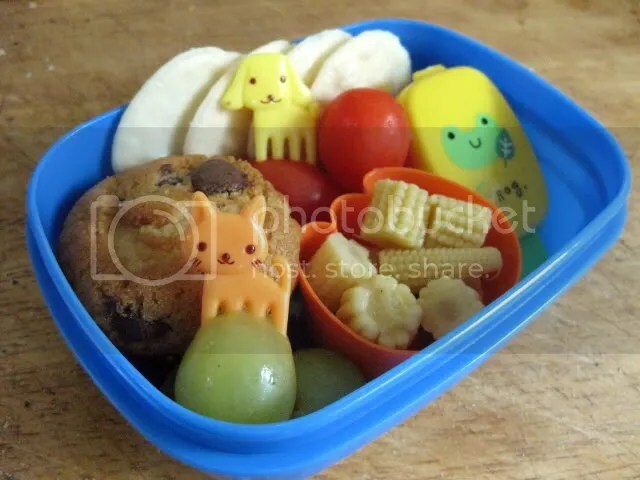 The pictures in this post are all toddler bento – and very young toddler at that. 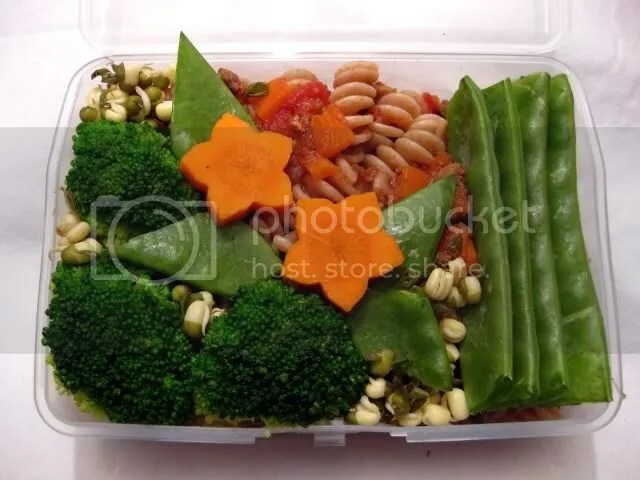 One of the nifty things about bento is that their size is well defined – there are rules for working out the size bento you need, and filled according to the ratio 3:2:1 starch:vegetable:protein with fresh foods you can work out their calorific content based on volume. The box in this picture is 675ml, which is a rather large bento for a woman, and packed 3:2:1 (which is roughly what I managed today) it should be equivalent to about 675 calories. I know I was stuffed by the time I finished it today! My dad used to pack my lunch and it was the ol’ paper bag with a ‘surprise’ sandwich – surprise because you might have Vegemite one day and tongue with relish the next… it was GROSS! Just coming back to this cAt and noticed that they’re all bento’s for LOs! How adorable – my kids would love them! I LOVE the look of the one you packed for you – SO healthy!